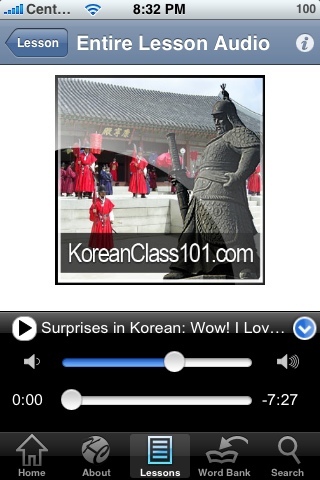 Are ready to master a language on your iPhone or iTouch in just minutes a day? Say goodbye to expensive language lessons and expensive software programs. Gone are the days of expensive immersion trips and 20 CD sets that are still sitting in the box in the corner. Pod101 Lite is like having a state of the art language lab in your pocket. Actually, that statement is not entirely honest, this application is better than a language lab! In the language lab, you don’t get two experts teachers to personally walk you through the pitfalls and pleasantries of mastering the language. With Pod101 Lite you do. Detailed explanations by your own Personal Teachers – You get it! One tap of the screen line-by-line audio of the dialog – You get it! Review Track to practice and master lesson specific vocabulary and phrase - Yep, you guessed it. Vocabulary List with audio playback and voice recording – You get it! 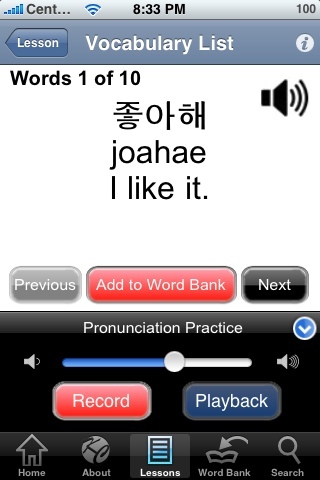 Vocabulary Flashcards and Sample Sentences with audio and translation - You get it! A detailed grammar point and cultural insight – Yep, You get it too! So what’s so special about all of these features? Well, combined they deliver results. The fastest, easiest and most fun way to master the language, Guaranteed! With Pod101 you’ll master listening skills, reading, speaking, pronunciation and even vocabulary, phrases and grammar! You will rapidly improve on EVERY aspect of language learning making this a complete package! 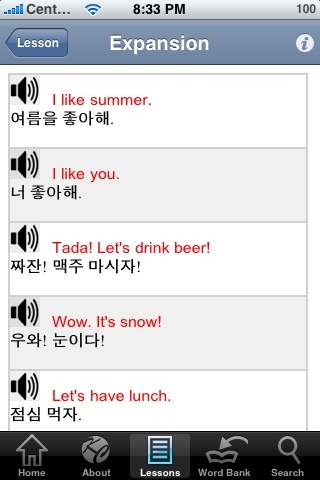 This application will have you speaking from the first lesson, and reading and conversing after just a few more. Get this application now, and see what the many other early adopters are saying about how fun and addicting this language learning application can be! Fast, fun, easy, engaging, and educational. Bottom line: it works, and people use it again and again. Find out now what all rage is about! Special gift to learn even faster included inside! Here are some screen shots of the newest application for the iPhone! Currently, we have 2 Korean applications. We’ll be sure to update with links when these are all ready and in the store!